Lenin's Mausoleum also known as Lenin's Tomb, situated in Red Square in Moscow, is the mausoleum that serves as the current resting place of Vladimir Lenin. His embalmed body has been on public display there since shortly after his death in 1924 (with rare exceptions in wartime). Aleksey Shchusev's diminutive but monumental granite structure incorporates some elements from ancient mausoleums, such as the Step Pyramid and the Tomb of Cyrus the Great. Soon after January 21, 1924, the day that Lenin died, the Soviet government received more than 10,000 telegrams from all over Russia, which asked the government to preserve his body somehow for future generations. On the morning of January 23, Professor Alexei Ivanovich Abrikosov embalmed Lenin's body to keep it intact until the burial. On the night of January 23, architect Aleksey Shchusev was given a task to complete within three days: design and build a tomb to accommodate all those who wanted to say their goodbyes to Lenin. 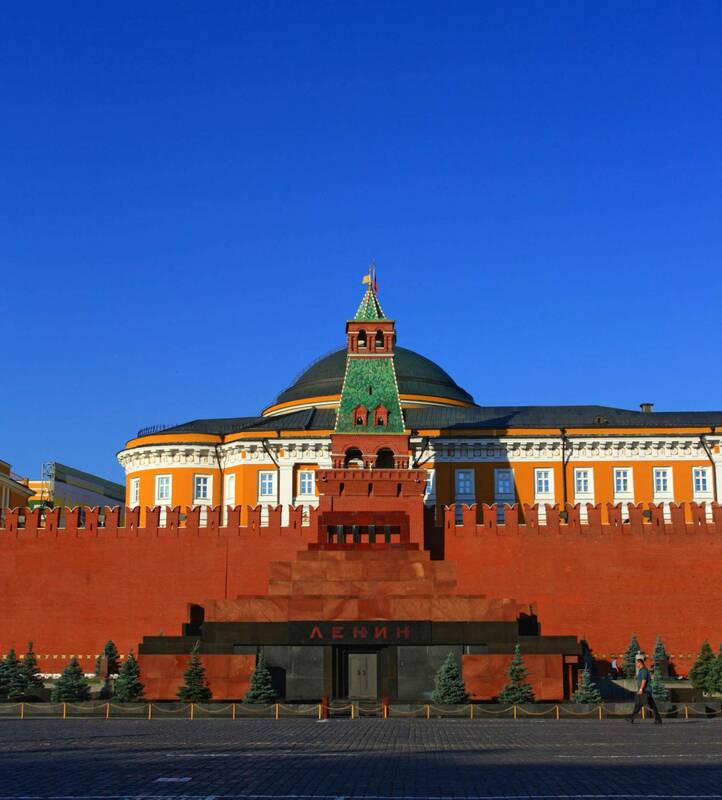 On January 26, the decision was made to place the tomb in Red Square by the Kremlin Wall. By January 27, Shchusev built a tomb out of wood and at 4 p.m. that day they placed Lenin's coffin in it. More than 100,000 people visited the tomb within a month and a half. By August 1924, Shchusev upgraded the tomb to a bigger version. The architect Konstantin Melnikov designed Lenin's sarcophagus. In 1929, it was established that it would be possible to preserve Lenin’s body for a much longer period of time. Therefore, it was decided to exchange the wooden mausoleum with the one made of stone. Marble, porphyry, granite, labradorite, and other construction materials were used. In October 1930, the construction of the stone tomb was finished. In 1973, sculptor Nikolai Tomsky designed a new sarcophagus. The body was removed in October 1941 and evacuated to Tyumen, in Siberia, when it appeared that Moscow might be in imminent danger of falling to invading Nazi troops. After the war, it was returned and the tomb reopened. Joseph Stalin's embalmed body shared a spot next to Vladimir Lenin, from the time of his death in 1953 until October 31, 1961, when Stalin was removed as part of de-Stalinization and Khrushchev's Thaw, and buried outside the walls of the Kremlin. The Mausoleum is open every day from 10:00 am to 1:00 pm, except Mondays and Fridays. 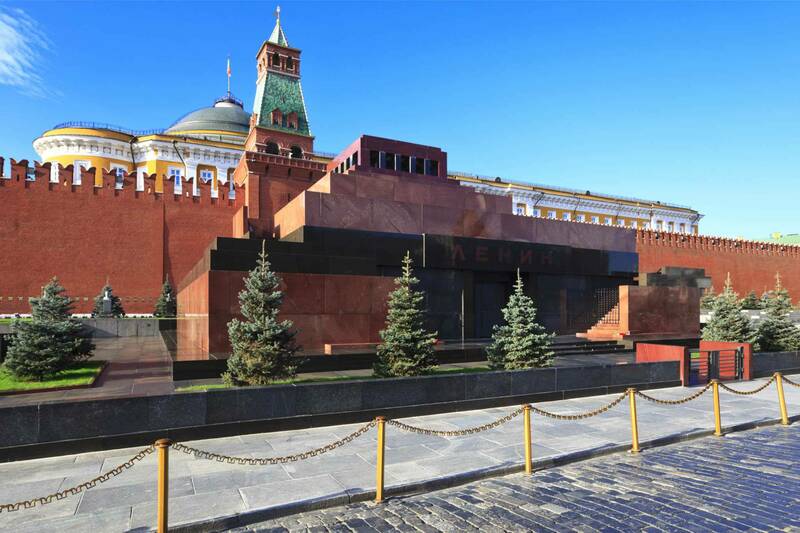 Visitors still wait in long lines to see Lenin's body, for which entrance is free of charge. Visitors are required to show respect while in the tomb; photos or video are forbidden, as are talking, smoking, keeping hands in pockets, or wearing hats (if male). The mausoleum is still heavily guarded, although the Changing of the Guard has been moved to the Eternal Flame by the Tomb of the Unknown Soldier. Debate continues as to what to do with Lenin's body and there is serious talk of burying him. 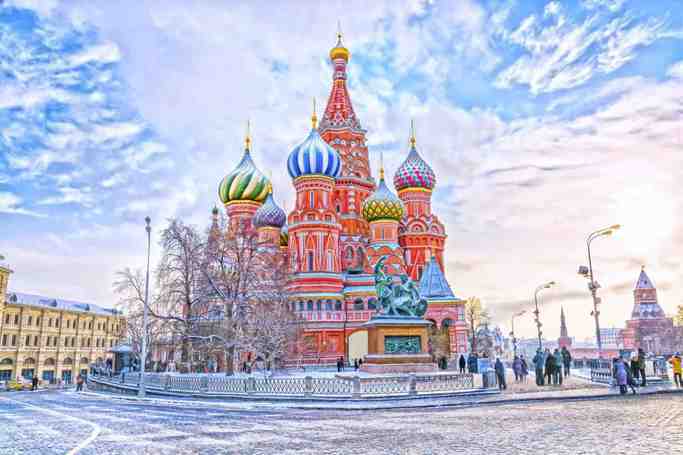 Lenin's Mausoleum | eTips Inc.